We present our Tax Free Shopping Bag Festival PowerPoint Templates PPT Background for Slides 1112.Use our Festival PowerPoint Templates because; there are various viable propositions available to further your commercial interests. Use our Events PowerPoint Templates because; inform your team of your ideas using our illustrative slides. Use our Marketing PowerPoint Templates because; Use this template to explain the value of its wellness to human life. Use our Finance PowerPoint Templates because; Take your team along by explaining your plans. Use our Business PowerPoint Templates because; Break it all down to Key Result Areas. Use these PowerPoint slides for presentations relating to "Shopping bag tax free, finance, marketing, festival, events, and business" .The prominent colors used in the PowerPoint template are Green, White, and Black Allay their apprehensions with our Tax Free Shopping Bag Festival PowerPoint Templates Ppt Background For Slides 1112. Your thoughts will help build their faith. 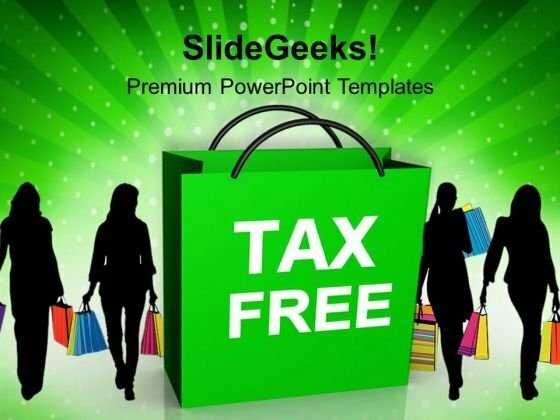 Our Tax Free Shopping Bag Festival PowerPoint Templates Ppt Background For Slides 1112 are clairyovant. They discern your demands before you make them.